Kudos, first of all, to David Yoo for perfectly capturing the world of middle school. I found myself giggling out loud as Peter and Drew navigated the perils of this new school experience. From their voices, to the snark, right down to the bullies, everything was there in perfect color. I'm not kidding. It took me back to my middle school experience and, although I wasn't in the same position as Peter, I had not a single problem falling into step with these wonderful characters. The chemistry between these two characters is amazing! Peter is the brains of the operation, and it's no surprise that he might just sometimes be a little bit of a liar. After all, schemers generally are. Sweet Drew is his loyal friend, who is also the voice of reason in the friendship. Whenever Peter comes up with a particularly odd plan, it's Drew who has to remind him it just might not be for the best. I was giggling out loud at the way the two of them interacted. I admit that Drew was a bit of a pushover, but charismatic Peter is a tough character to follow. They compliment one another perfectly. What I most enjoyed about The Detention Club was the message underneath everything. 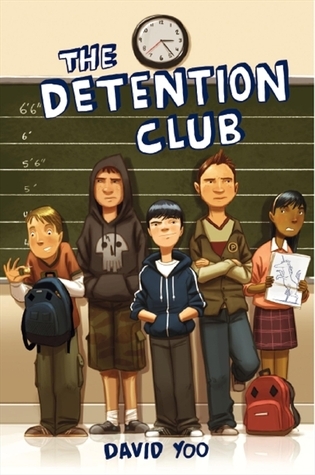 Buried under the funny parts, and the banter, is a story that all middle school kids will be able to connect with. All Peter and Drew want to do is fit in. They want to be popular enough that they have other friends, and don't feel like losers. However as the book goes on, Peter realizes that Drew isn't always going to be completely on board with his crazy schemes. We all grow up sometime don't we? He also uncovers that people might not always be what they seem on the outside. Most of all, he realizes that no matter who we are, just being ourselves is perfection. Who wants friends that make you change for them anyway? It might all sound a little cliche, like the lectures our parents give us when we're young, but now that I'm older don't I know it's the truth. David Yoo has perfectly masked these very important lessons under a story that is quick-paced, funny, and filled with things that younger readers will connect with. Honestly, I'm so happy I was given the opportunity to review this book! I fully intend to take it to the 5th grade class at the school I work with and let them read it. Maybe it will give them some good early pointers for what's to come! Recommended most definitely! If you have a younger reader, I can't deny they'll fall in love with Peter, Drew and their crazy cohorts. Just be ready for the sounds of giggling from the other room.